The Mughals ruled India for over 300 years and some of their contributions to the country in the field of art and architecture are unparalleled. While there were periods in between the Mughal rule that were peaceful and produced some of the best world-renowned monuments of India, many people forget that the struggle to get hold of a new territory often results in a lot of bloodshed. The same was the case with the Mughals invading Punjab during early 1700s. This tale of invasion through brutality in the region of Punjab in early 1700s shows how bloodthirsty Mughal rulers demonized the sacred community of Sikhs around that time. Baba Banda Singh, the army general under the patronage of Guru Gobind Singh, was tasked with clearing out the cruel rulers of Punjab. In no time, the disciplined and noble Banda Singh was able to take hold of various areas in Punjab including Samaana, Sonepat, Shahbaad and Kapoori that were under the control of Mughals who maltreated the local farmers and their families. By 1714, Banda Singh and his army had freed most of Punjab from the Mughal rule but now faced more and more attacks from the sultanate that was wary of its fading influence in the region. In December 1715, Banda Singh and 800 Sikh men in his army were captured in a Garhi, where they had been surviving for the past eight months after an ambush. Zakria Khan, the son of Abdu Samad who had ordered Banda's capture, was tasked with presenting this ‘gift' to the ruler in Delhi, Farakh-Seyer. But for him, Banda Singh was too small a gift for the ruler and, therefore, he ordered his men to behead every Sikh who would cross their path while travelling from Lahore to Delhi. The procession which had Banda Singh at the center included 760 prisoners in chains and 200 heads on spears. The procession finally reached Delhi in February 1716 and almost 700 of Banda Singh's men were beheaded in front of the Delhi Gate at Khuni Darwaja. This kind of brutality was unseen at that time and a huge flock of locals gathered to witness this atrocity. But it just didn't stop there. Baba Banda Singh was, then, traumatized near Qutub Minar where 26 of his closest associates were beheaded in front of him with the hope that he might reveal his army's strategies and give up assets but he did not budge. When the Mughals saw that Baba Banda Singh just did not break, they decided to make a show of his son's planned execution. His son was seated on his lap and the executioner carved out his heart through the chest and thrust it into Baba Banda Singh's mouth. 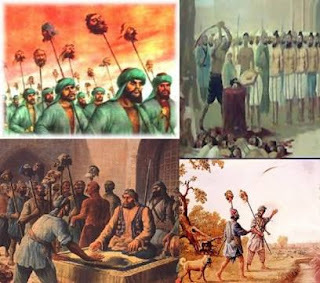 This excruciating barbarianism on part of Mughals is still remembered as the goriest incidents in the history of India. 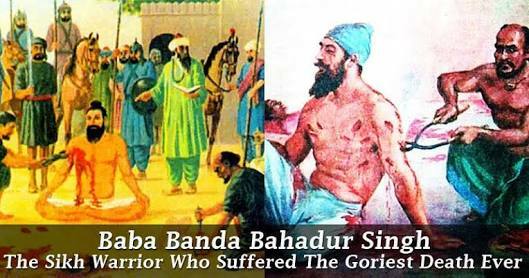 Banda Singh Bahadur was finally killed after Mughals gouged out his eyes with daggers, cut off his hands and legs with hot rods and beheaded him as he fell unconscious.Farakh Seyer, who ordered this torture of Banda Singh, met with the same fate at the hands of his own men after there was a revolt against him. But this dreadful execution of Banda Singh and his men still remains the most inhumane act by the Mughals during their 300-year rule.